People today have access to an immense pool of information and if you can’t get to the point, they will simply move along. This means that it’s important for nonprofit organizations to convey their message in a concise and compelling way. Informing and mobilizing donors is further complicated by the variety of channels used for nonprofit communications. The language you use on your blog can’t just be copied and pasted into an email or Tweet. To reach supporters across all your organization’s communication channels, you must pay close attention to the purpose of your message and the unique characteristics of email and social media platforms. The first step to crafting concise, effective communications is to identify the very core of the message you’re trying to send. It makes sense to offer a lot of background information and resources on your organization’s website, but as soon as you try to send your message into someone’s inbox or social network, you don’t have the option to include every detail. You must convey the most important information in the most engaging way. What action am I trying to elicit? By focusing on the main idea and objective, you can see what truly belongs in your message. When it comes time to compress your message into fewer words, you can cut text that doesn’t relate to the questions above. When it comes to their inbox, your audience holds most of the power. They can open the email and hear what you have to say or ignore you completely, and the decision rests largely on the quality of your subject line. The stakes are high, but your time to make an impression is short. Most email inboxes only display 50 characters in the subject line, but you may not even have that much space. Sixty six percent of emails are now being opened on mobile devices, which may display less than 20 characters. Fortunately, you don’t have to try to fit your whole message in the subject line. You just need to pique the reader’s interest enough to get them to click. Even if someone opens your email, your message still needs to be focused and formatted for the occasion. 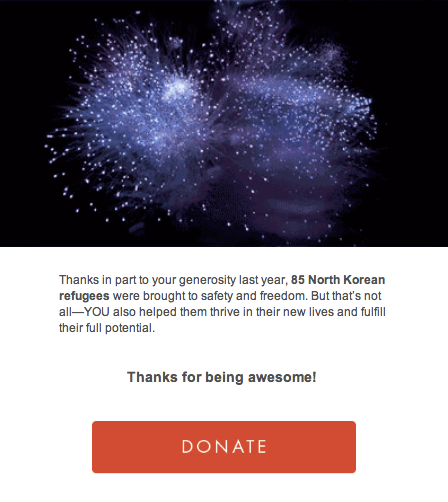 Emails offer you some space to explain your mission or campaign, but they’re really a vehicle through which a potential donor should click to reach your website or donation page. The text should be presented in short, scannable paragraphs and punctuated with images and CTAs. 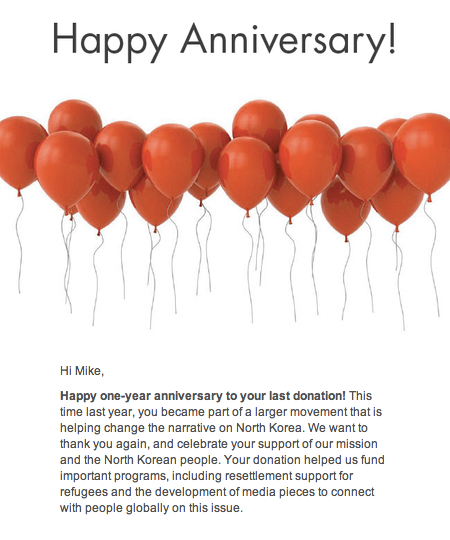 This email from Liberty in North Korea has a big headline to show what the message is about. They are also fairly efficient with their text and include a brightly-colored CTA. If your organization’s website is your space and the inbox is the supporter’s turf, social media is neutral ground. Nonprofit organizations have every right to be there, but if you want to create strong connections and relationships, you need to communicate appropriately. Social media communications tend to be shorter, bite-sized messages, but the exact length and tone of your posts will depend on the platform and your organization’s presence there. Begin by taking stock of your primary social networks. Some of the most popular networks for nonprofits are Facebook, Twitter, LinkedIn, and Instagram. 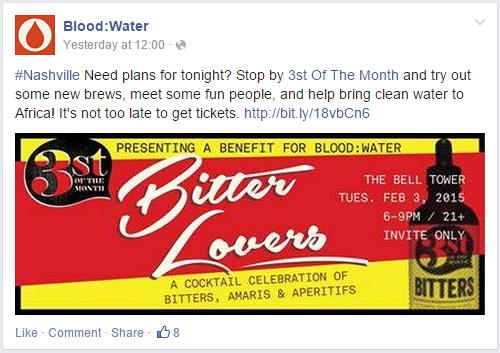 Here’s an example of how Blood: Water adapted a message about a fundraising event across several platforms. Blood: Water partnered with a craft cocktail event called 3st of the Month to raise money. While the details are available on the event’s blog, Blood: Water needed to get the message out to their own supporters. To share the news with their followers on Facebook, Blood: Water put the most important information in the text of their post and shared an eye-catching event image. To make sure their audience could get more details, they also tag 3st of the Month and link to the partner’s event page. 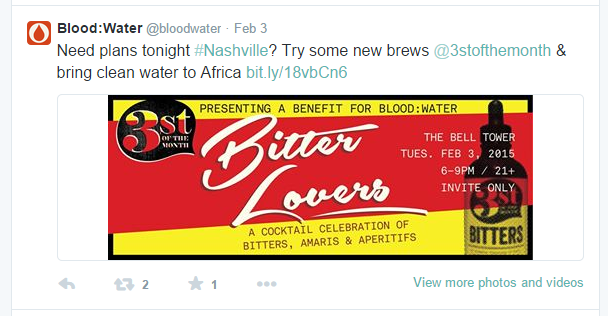 At first glance, this tweet from Blood: Water looks a lot like the Facebook post. This makes sense because in both cases the nonprofit had to distill the message to match a platform. Because Twitter posts are so limited in size, however, Blood: Water had to cut the text down. Most importantly, they still give the audience easy access to more information. This is one example of how an organization can publicize an event or campaign on multiple channels, retaining the vital details while adapting the message to its platform. Here are some important qualities about each major social networks to help you adapt your messages for each platform. • Twitter – Short, pithy updates of 140 characters or less. Frequently used to share links and images. Great for networking with like-minded users and recognizing supporters. • Facebook – Facebook posts are often longer than Tweets. The platform is used to share pictures, videos, stories, and links. The ability to comment on posts helps create a dynamic conversation. • LinkedIn – A hub for professional profiles and updates on business, the nonprofit sector, and best practices. Widely used for professional networking and references. Great for sharing blogs and articles. • Instagram – A network specifically for displaying and sharing pictures, graphics, and short videos. You can include titles and link out to landing pages or blogs, but this is a platform for visual content. By combining the core of your message with an understanding of the channel you’re speaking through, you can deliver fundraising and impact information to a variety of audiences. With the number of different communication channels nonprofits now use to reach supporters, you need to present a consistent, compelling message in a number of ways. While the number of words and formatting may change, understanding the core of your message will help you give the most vital information, no matter the platform.